Generating an informative display of groundwater withdrawals can sometimes be difficult because the symbols for closely spaced wells can overlap. An alternative method for displaying groundwater withdrawals is to generate a “footprint” of the withdrawals. WellFootprint version 1.0 implements the Footprint algorithm with two optional variations that can speed up the footprint calculation. ModelMuse has been modified in order to generate the input for WellFootprint and to read and graphically display the output from WellFootprint. 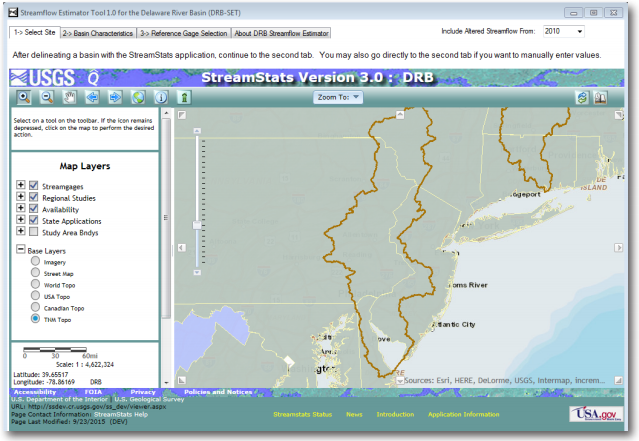 The Delaware River Basin Streamflow Estimator Tool (DRB-SET) is a tool for the simulation of streamflow at a daily time step for an ungaged stream location in the Delaware River Basin. DRB-SET was developed by the U.S. Geological Survey (USGS) and funded through WaterSMART as part of the National Water Census, a USGS research program on national water availability and use that develops new water accounting tools and assesses water availability at the regional and national scales. The USGS Pennsylvania Water Science Center is your direct link to all kinds of water-resource information. Data collection and interpretive studies are done in cooperation with various local, State, and Federal agencies. The Consortium for Scientific Assistance to Watersheds (C-SAW) is a team of specialists who provide free organizational and scientific technical assistance to Pennsylvania-based watershed and conservation organizations. C-SAW does not conduct watershed monitoring or assessments but can provide technical assistance for watershed organizations wanting to start or improve their own monitoring and assessments. C-SAW can help your group learn how to assess watershed health & develop monitoring programs, protection plans, and restoration projects aimed at improving conditions in your watershed. C-SAW assistance is provided at no cost to qualified applicants. Assistance is made possible by a Pennsylvania DEP Growing Greener Grant awarded to Pocono Northeast Resource Conservation & Development Council and its partner institutions located throughout Pennsylvania. Just What Is a 100-Year Flood Anyway? Almost everyone has heard the term "100-year flood", but not everyone knows what it really means. A common question is, "we just had a 100-year flood a few years ago, why are we having another one so soon?" The USGS Office of Surface Water has released a poster that explains the concept, probabilistic nature, and inherent uncertainties of a 100-year flood. 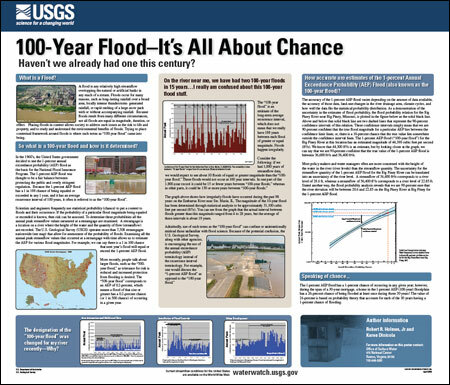 The poster, entitled "100-Year Flood-It's All About Chance," can be found at http://pubs.usgs.gov/gip/106/.